18+ Wood Division Champs, the Coral Gables A’s. 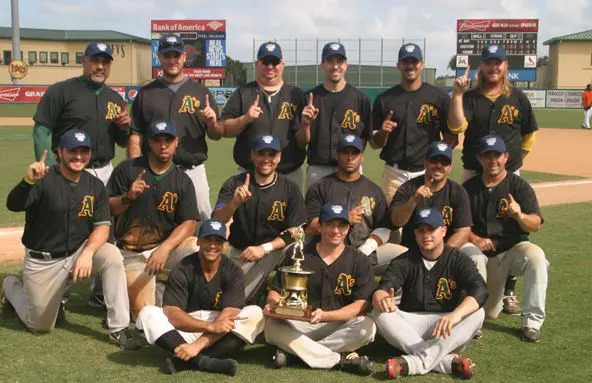 In one of the most exciting conclusions at the 2011 Fall Classic, Alvaro Gomez scored the game-winner on a wild pitch in the bottom of the 10th inning to give the Coral Gables A’s a 6-5 win over the Coastal Stingrays and their first Fall Classic title. Gomez’ dirt-spraying, head-first slide under the tag of reliever Jonathan Batts put an exclamation point on a comeback that began three innings earlier, and kicked off a celebration that was six years in the making. The A’s tied the game in the ninth when Mike Schatzoe, 0-for-3 to that point, singled in Vengocchea and Portes. Freeman, whose earlier error cost the led to an A’s run, initiated a spectacular 4-6-3 double play to end that inning and preserve the tie. The Rays went in order in the ninth and 10th then Pichardo traded places with catcher Batts to start the fateful 10th. The A’s weren’t new to winning. They conquered the Holiday Classic at Disney and the Grapefruit Classic in Ft. Meyers in 2010, but a Fall Classic title eluded them until Gomez belly-flopped onto home. In 2004 and 2005 the A’s watched the other guys do the celebrating in the finals. “It feels great,” said manager Miguel Garcia. “It was a roller coaster ride. We definitely made it interesting. It was one of those games where we got down early and our ace Jason Privett kept us in the game, Garcia said. The Rays finished 2-2 in pool play. They lost a 2-1 thriller to the A’s in their third pool game. Pichardo and Brian Schaeffer anchored the staff with two nine-inning outings each. “Without those two guys we wouldn’t have had enough pitching,” said Batts, the Rays’ skipper. The A’s were 3-1 in pool play. Third baseman Jose Zabala and Privett were named tournament co-MVP’s. Pichardo, Batts (10) and Batts and Pichardo (10). Privett and Portes.